Practical test centre, short notice tests car hire. The car parking bays are in front of test centre. If car park is full, park on access road safely and legally. Male and female toilets available. This centre provides tests for cars. Hayes Driving Test Centre is located in and around busy industrial trading area. There are several mini roundabouts close to the test centre and a mixture of duaal carriageways, country roads. Watch out for no entry signs and changing speed limits. The testing examiner will require you to demonstrate a sound knowledge of various road systems to include busy junctions, roundabouts and crossroads. Residential built up roads that are narrow and meeting oncoming vehicles is likely. 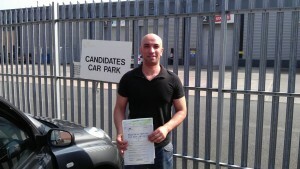 Hayes Driving Test Centre is located near Hillingdon, Stockley Park, West Drayton, Yeading,. The examiner will require 1 driving test manoeuvre (bay parking is unlikely to be asked) with a 1 in 3 possibility of the emergency stop procedure. The test will allow for 10 minutes of independent driving from the 37 minute test.